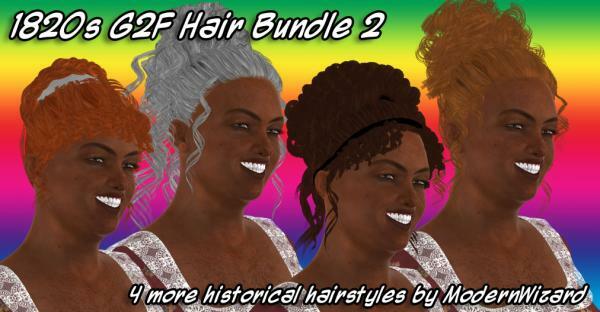 This bundle contains 4 hairstyles, Ailsa, Beileag, Liziko, and Zsoka, representing some popular hairdos for Western women in the 1820s [plus or minus a few years], constructed with reference to period likenesses. Updos inspired by those of Ancient Greece were popular, so there were a lot of headbands, curls gathered at the crown of the head, and loose ringlets artfully dangling down the neck. Lovely, lovely, lovely! Thank you very much! Arcadium69 (3 years ago) Inappropriate?